Quentin Tarantino's Death Proof is an incredible work of pop/exploitation cinema. This is a film that cannot be placed in one specific category. It's a mix of slasher film (e.g. Friday The 13th), car chase film (e.g. Vanishing Point), girl gang film (e.g. Faster Pussycat! Kill! Kill!) and one of QTs most favorite subgenres: the hangout film (e.g. Dazed and Confused). Add to the mix some Southern seasoning, a shot of chartreuse and you will begin to get an idea of what Death Proof is like. Tarantino was initially inspired to make this film from watching his favorite 70s/80s Slasher Films but being a post modern filmmaker and genre re-inventor, he decided to go somewhere else entirely with the standard "hack em up in a row" storyline. Tarantino also did with Kurt Russell in Death Proof what Sergio Leone did with Henry Fonda in Once Upon a Time in The West. He took someone that was known for being the blue eyed All American good guy in movies and turned him into a cold blooded psychopathic killer. The ambiguity of those kinds of characters is what makes them so interesting to me. As most of us know, real killers aren't deranged looking monsters wearing hockey masks, they're the (seemingly) normal guys that live next door. Thats who Stuntman Mike is meant to be patterned after. The whole cool "Stuntman Mike" character is the front which hides the frightened vulnerable being. Its very realistic. Its also part of the traditional slasher film formula in which the Final Girl (or Final Girls in this case) rise up, becoming even tougher than the male characters and take out the invincible killer who has been preying on the unsuspecting victims. QT is both following the genre's rules and making it cooler/expanding on it by having it be a girl gang instead of just one Final Girl (like in Halloween, Friday The 13th or Nightmare on Elm Street). In an interesting twist, the first Final Girl featured in Death Proof, Arlene (Vanessa Ferlito) is ultimately killed off, which is another curveball Tarantino throws audiences. On another level I think Tarantino was sort of poking fun at the tough guy type characters (like Russell plays) in movies. He is really saying that regardless of how tough men are, women can *beep* them up just as bad as another man (a theme he's been interested in since True Romance). I loved it since I grew up seeing every kind of tough guy movie out there. Death Proof is an amalgam of not only the slasher film/car chase film/girl gang exploitation films, its also bringing in ideas from the Asian kung fu & samurai films which often had females (Deadly China Doll, Deep Thrust, Lady Snowblood, Female Convict Scorpion) as the main heroes. Thats the reason why QT threw in the trademark triumphant Shaw Brothers style kung fu freeze frame/music sting at the end. Many people have complained about QT putting too much dialogue in this film, (ironically, many complained that there wasn't enough in Kill Bill!) but I found that it was actually some of his best work as a screenwriter. There is a different type of Tarantino chatter presented, mainly because we are listening to women speak to each other for most of the running time. Instead of male oriented subject matter (like we heard a lot in Dogs) we hear what women talk about when they're in the car or at a diner. It is still the poetic, quirky, comedic dialogue we know Tarantino for, but it is written through a female perspective. I found it to be really refreshing and a departure for Tarantino as a screenwriter. 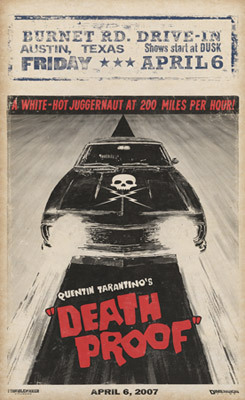 Death Proof was also made to play and look like a true Grindhouse style film as well. It's a genuine "Frankenstein print" as QT calls it, which means every reel is in a different state of quality. One reel may be faded and contain editing errors, the next may be in black and white (a common occurrence in the Grindhouse era) and another reel may be a pristine IB Tech print (the crown jewel of celluloid cinema). A lot of the ideas and concepts in Death Proof may be overlooked and/or misunderstood on first viewing but being a longtime Tarantino fan, I know for a fact that his attention to detail is not up for question. He has a precise idea what he wants in his films and he did an amazing job creating the world come alive inside Death Proof. From the dialogue to the use of music to the cinematography to the action, QT has a unique eye and ear for cinematic storytelling. He has proved once again that regardless of genre (or subgenre), he can keep the same kind of high falutin' energy and brilliance as he did with his early crime based films. You can always tell that QT does not make movies to have the images glaze over peoples' eyes and not touch them in some way. He makes movies for people like him who really love them and who want to invest time in his cinematic worlds while seeing something new and offbeat each time out. If you watch Death Proof and let yourself get into it, you will surely have a wild, entertaining film experience, guaranteed. This page was last edited on 5 September 2015, at 19:23.